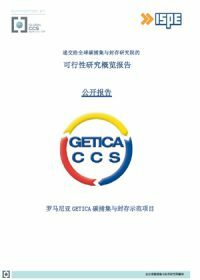 Getica CO2 포집 및 저장 (CCS) 실증 프로젝트는 루마니아 (Romania) 남서부 개발 지구 소재의 화력 발전소에 설치한 대규모 통합 CCS 실증 사업으로, 가동 예정시기는 2015년 12월이다. CCS 체인 (포집, 운송, 저장)에 대한 타당성 연구는 루마니아 (INTETECH Consultancy – 영국에서 지원)의 Institute for Studies and Power Engineering (ISPE), 독일의 Alstom Carbon Capture, 루마니아의 GeoEcoMar와 프랑스의 Schlumberger Carbon Services로 구성된 컨소시엄이 진행한다. Given that electricity generation in Romania is primarily based on coal, implementing CCS would greatly reduce CO2 emissions while keeping coal-fired power plants operational. This financial scenarios report describes the optimum solution to financing a large-scale CCS project in Romania. It considered the challenges of finding and securing financing sources for the project. The existing financing sources, at European Union (EU) and national level, were analysed in terms of financing structure of the project, project eligibility, origin of financing (public/private), availability of funding, availability in time, and degree of certainty. Three scenarios were created, based on the prospected funding sources for CCS projects. 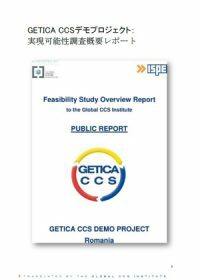 A qualitative assessment was performed and, based on this assessment, the optimum scenario was chosen for the GETICA CCS Demonstration project. The Romanian CCS Demonstration Project is to implement a full chain operational CCS system, capturing 1.5 million tonnes of CO2 emissions per annum from an existing 330 MW unit (no.6) of the Turceni Power Plant in Oltenia, Romania. The CO2 from the capture plant will be transported using (where possible) existing onshore natural gas pipelines and stored underground in onshore deep saline formations within a 50 km radius of the power plant. The purpose of the feasibility study for the CO2 capture plant is establish, amongst other things, appropriate CCS capture technology for the Getica CCS Demonstration project, the material balance and block flow diagrams for the capture facility, integration concepts, accurate cost estimates, and a preliminary execution plan. 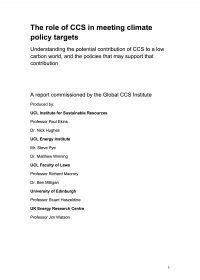 This report aims to help similar CCS projects using post-combustion capture technology. The Romanian CCS Demonstration Project is to implement a full-chain operational CCS system capturing 1.5 million tonnes per annum of carbon dioxide (CO2) emissions from an existing 330 MW unit (no.6) of the Turceni Power Plant in Oltenia, Romania. The CO2 from the capture plant will be transported using (where possible) existing onshore natural gas pipelines and stored underground in onshore deep saline formations within a 50 km radius of the power plant. The purpose of the Permitting Report is to identify relevant permits and competent authorities involved in the permitting process, to create a permitting map and a permitting time schedule, and to identify the authorities and the permits considered 'critical' to the development of a CCS project in Romania. This report aims to help similar CCS projects (using post-combustion capture technology) to identify the attention points and needed conditions to get a successful permitting process.